310-SPCA (7722) is a 24-hour call service for Ontario to report cases of animal cruelty and neglect. All calls to this service will be assessed by a trained operator and the report will be assigned to the appropriate enforcement officers. 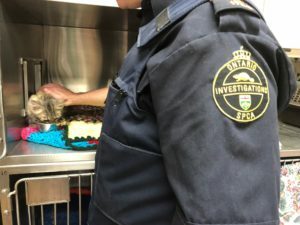 To report suspected animal abuse or neglect you can call Ontario SPCA at 310-SPCA (7722), call the Guelph Humane Society at 519-824-3091 or email investigations@guelphhumane.ca. Animal cruelty is when an owner or custodian fails to provide an animal with proper care, water, food, or shelter or when an individual abuses an animal or causes or permits unnecessary hardship, privation or neglect. 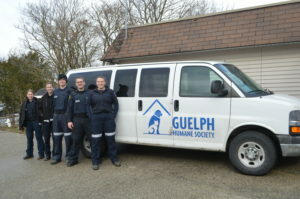 The Guelph Humane Society’s specially trained agents are appointed under the Ontario Society for the Prevention of Cruelty to Animals (OSPCA) Act. Our prevention team enforces provincial and federal laws that pertain to animal cruelty. In some cases, education is the best measure. Increasing caregiver knowledge about proper shelter, food, preventative care and follow-up visits can improve the health and well-being of animals.